Whisk 1 table softened butter with 2 cups powdered sugar, 2 tables corn syrup and 2 teas fresh squeezed lemon juice. Add milk, 1 table at a time until it is of spreading consistency. I added 1 table fresh lemon zest. When cake is cooled, drizzle glaze over cake allowing to run down the sides of cake. Preheat oven to 350. Grease and flour a 12 cup bundt cake pan. Whisk the 3 cups of flour with the salt and baking powder. In a separate bowl, beat 2 sticks butter with the sugar and oil with mixer on medium until fluffy, about 5 minutes. Turn mixer speed to low and beat in the eggs, one at a time, then mix in vanilla. Add about 1/3 of the flour mixture and half of the buttermilk. Beat, scraping sides down as necessary. Add another 1/3 of the flour mixture and the remaining buttermilk. Mix just until combined. Add the remaining flour mixture by stirring it in. You do not want to overmix. Toss the blueberries with the 2 tables of flour in a bowl. By hand, stir in the blueberries into mixture, just until incorporated. I used a spatula. Pour batter into prepared pan and bake about 1 hour, or until cake tests done. When cake is done, allow to sit in pan about 10 minutes and then turn out onto serving platter. Allow to sit about 30 minutes then drizzle glaze over the top. 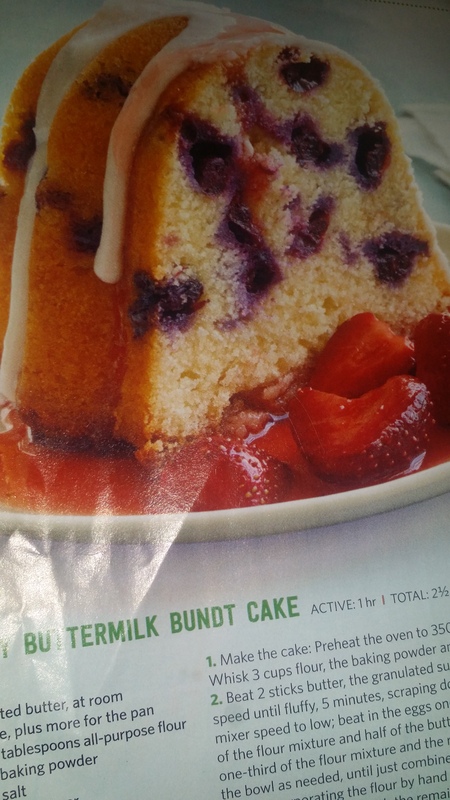 Garnish with fresh berries if desired.